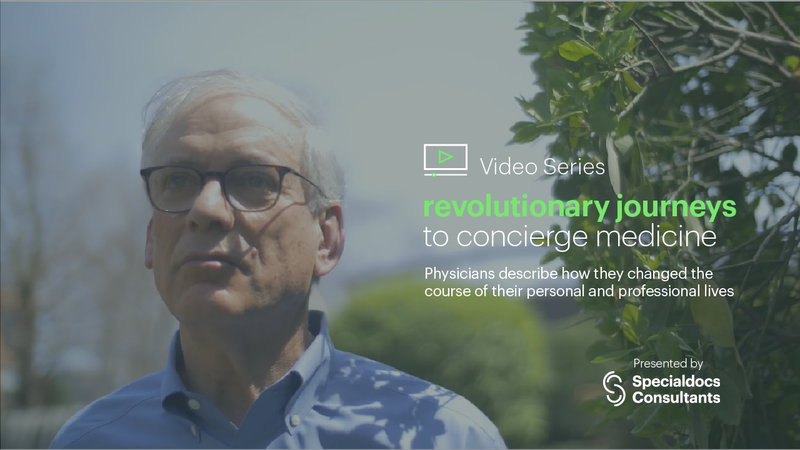 Specialdocs Consultants is releasing a new video series depicting the journeys of several physicians who’ve transitioned from traditional practice to a concierge model practice. In their own words, the physicians illustrate the continuing challenges of the traditional practice model and how they were able to make a successful transition to concierge medicine. A common theme throughout the series is how the traditional model disproportionately values RVU volume over quality of care and how this imbalance prevents physicians from reaching their professional potential and results in widespread physician burnout. Dr. Amanda Collins-Baine of Darien Signature Health and Dr. Judith Shea of Glenville Medical Concierge Care are among several physicians who credit the concierge model with extending or saving their careers. “I just knew that I couldn’t continue to see 25 patients a day and feel good about it and have any type of work-life balance. When my nine-year-old said to me at 9:30 at night, ‘Mommy, do you mind if I talk to you while you’re typing on your computer?’… I knew it was time to make a change in order to sustain my career in medicine,” says Dr. Collins-Baine. Dr. Shea agrees and says the concierge model provides the ideal way for physicians to practice medicine. Dr. Larry Leibowitz of Matrix Personalized Medicine says that the concierge model creates an environment that’s beneficial to both the physician and the patient. “All of those things that we’re not ‘compensated for’ in traditional primary care medicine are the most essential things. Now, I get to dive into those things like I never did before. I’m never going back [to traditional practice]. It’s been fantastic and I can see it in my patients’ faces. They love it,” says Dr. Larry Leibowitz. For many physicians the decision to transition their practice to a concierge model can be difficult. They have concerns about how they’ll communicate the transition to their patients, what percentage of their patients will make the transition with them and who will handle their patients’ membership billing. Specialdocs Consultants, a concierge medicine consulting company, provides the services, solutions, experience and insights that are critical to a practice before, during and after the transition to the concierge model. When Dr. Jeffrey Weinberger decided he was ready to adopt the concierge model, he turned to Specialdocs for support. He says choosing the right partner was critical in helping him make a successful transition. Dr. Jeff Puglisi, also of Glenville Medical Concierge Care, says the group chose Specialdocs because of the highly-personalized approach the company has towards their physician clients. “[It] was a no-brainer. We chose Specialdocs after months and months of talking about it…because of the interactions we had with them one on one, in the office here, over dinner, on the phone. Their entire team is so creative, so thoughtful,” says Dr. Puglisi. Specialdocs CEO Terry Bauer says the personalized approach is ingrained in the company culture and started with the company founders. Bauer says he continues to be inspired by the tremendous improvement these physicians have made in their personal and professional lives — and the role Specialdocs plays in making that happen. “We believe that there’s not a more important group of professionals in the world. These are really intelligent, caring and special people who are making one of the biggest decisions of their lives. Accordingly, Specialdocs treats the entire process with respect, collaboration and an intense focus on each individual client and their visions, goals and objectives,” said Bauer. The videos are available now on the Specialdocs Youtube Channel. © 2019 Specialdocs Consultants, LLC.